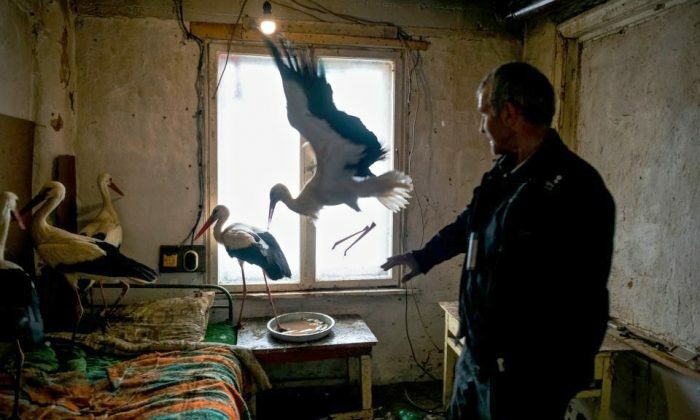 Bulgarians are taking storks out of the freezing weather and into their homes. Halil, a road maintenance worker from the village of Zaritsa, started the phenomenon that others in the region are following, hoping to rescue storks with frozen wings from the cold, The Guardian reported. Social media photos of people helping the birds have further pushed the issue into the public mind, Balkan Insight reported. Some photos show the birds looking ragged due to the weather, as locals try to dry them out and let them rest in warmth. “It is minus 3C [27 F] today and the weather is getting worse,” said Halil, justifying his plan to keep the storks in his home until it gets warmer, via The Guardian. A cold snap in the northeast of the country stranded many migrating storks. The birds’ frozen wings are grounding them. The weather is forcing them to sleep on the ground rather than up in trees, according to The Guardian. Ovidiu Bufnila, from the Romanian Ornithological Society, advised against catching storks since it would cause them to panic and lose precious needed energy. Two hundred small birds froze to death in Romania just a few days prior, The Guardian reported. Bulgaria had 6,000 inhabited storks nest in 2016, 1,000 more than in 2006. High winds, snowstorms, and below freezing temperatures will continue to trouble the current population of storks for at least a few more days, according to The Guardian. “It’s the first time that we have seen so many storks in distress in Bulgaria,” said Hristina Klisurova, from the Wildlife Rehabilitation and Breeding Centre—Green Balkans, via The Guardian. She told people via television to “avoid taking in just any stork” but instead to only take “those who are in a state of distress, injured, or with frozen wings,” and to release them as soon as possible, according to The Guardian. Bulgarians have taken more than 40 storks out of the cold and into their homes, The Guardian reported. But the Ministry of Ecology and environmental organizations are telling people that cold is not a big danger to birds since they’re used to it. Nonetheless, they still said frozen feathers and wings can be dangerous, according to Balkan Insight.